"Yes", GTE will increase your total energy expenditure (TEE) and decrease the ratio of glucose to fat you're burning at rest and during your workouts, but "NO", it won't make your abs appear w/out dietin'. You will remember that I am not exactly a fan of green tea extracts. In spite of the fact that there are studies that suggest reductions of both thyroid hormone and testosterone production, when you consume high(er) amounts, their anti-inflammatory effects appear to help (obese) people lose weight. In view of the fact that a recent study suggests that this does not interfere with the adaptational response to exercise, like vitamin C + E, for example (learn more), they are thus still among the most promising over-the-counter anti-obesity agents. With that being said, the increase in fatty oxidation is often mentioned when people try to explain why green tea helps (obese) people lose fat. As a SuppVersity reader, however, you know that a mere increase in the use of fats over carbohydrates will not translate into practical weight loss. Against that background it is important to investigate the effects of green tea extracts on both, the respiratory exchange ratio (RER), which is the quotient of glucose / fat that's used to fuel your basal and exercise-induced metabolic demands, as well as their effects on your total energy expenditure. Luckily, a recent study from the Charles Darwin University and the University of New South Wales in Australia includes both measures of changes in RER, resting energy expenditure (REE) and the total energy expenditure (REE + activity induced energy expenditure). Figure 1: Diagrammatic representation of the study design. * indicates blood collection. Lactate assessed at *1, *2, *4, *6, *9; catecholamines at *1, *4, *5, and glycerol at *1–*9 (Gahreman. 2015). But that's not all. The scientists also took a look at the potential mediators of increased energy expenditure and fatty acid use like catecholamines and they did so in normal-weight young women (age: 21.5 +/- 0.5 years; body mass: 65.7 +/- 1.8 kg; BMI: 24.3 +/- 0.4 kg/m²; maximal oxygen consumption; VO2max): 32.1 +/- 1.7 mL/kg/min) and not the usual subjects: Overweight or obese post-menopausal women or male and female patients with type II diabetes. Yes, it's official: Unlike vitamin C + E, GTE will not impair your gains! Ewa Jówko et al. (2015) were able to show that the consumption green tea extract (GTE) supplements in in dosages of only 245 mg polyphenols (including 200 mg catechins, among them 137 mg epigallocatechin-3-galate) does prevent the oxidative stress induced by repeated cycle sprint tests (RST) in sprinters without hindering the training adaptation in antioxidant enzyme system. What it does not do, either, is to decrease the exercise-induced muscle damage, or improve the sprint performance during the sprinters preparatory phase of their training cycle, though. Needless to say that studies involving different subject groups, dosages and training modalities would be required to eventually confirm that there are no anti-hormetic effects w/ GTE. I have plotted the most relevant results of experiment the design of which is represented graphically in in Figure 1 for you in Figure 2. Please note that only the changes in VO2 which are indicative of an increased oxidation of fatty acids and the corresponding RER, the quotient of carbohdydrate oxidation and fat oxidation changed significantly. 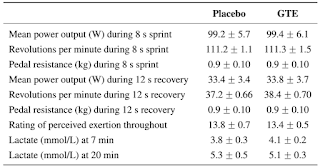 Figure 2: Response at rest and during and after intermittent sprinting exercise in the green tea and placebo conditions; data expressed as relative differences between GTE and PLA (Gahreman. 2015). 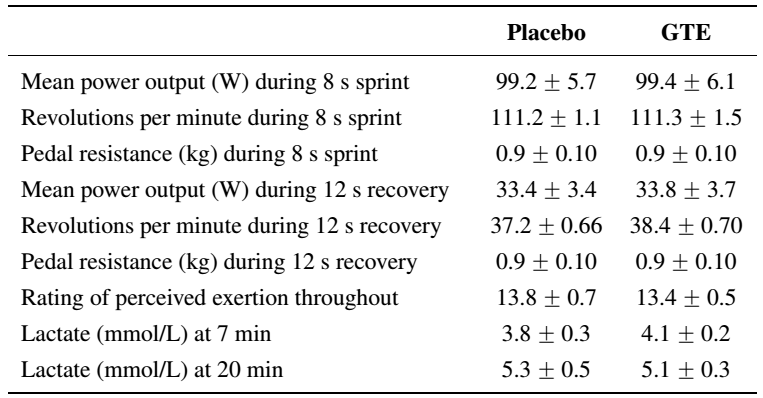 Table 1: Mean power output, rating of perceived exertion, and lactate response to the sprinting and recovery components of the intermittent sprinting exercise for the placebo and green tea conditions (mean and SEM | Gahrmen. 2015). There was a significant increase in fat oxidation post-exercise compared to at rest in the placebo condition (p < 0.01). After GTE ingestion, however, at rest and post-exercise, fat oxidation was significantly greater (p < 0.05) than that after placebo. Plasma glycerol levels at rest and 15 min during post-exercise were significantly higher (p < 0.05) after GTE consumption compared to placebo. There was no significant increase in total energy expenditure during or after exercise, though - that's in line with results Gregersen et al. (2009) generated in a study in normal-weight men, but different from some studies in normal-weight-to-moderately overweight men like Dullo et al. (1999) that report increases in TEE of ~2,8% over both, placebo and caffeine. Compared to placebo, plasma catecholamines increased significantly after GTE consumption and 20 min after ISE (p < 0.05 | not shown in Figure 2). The effects are almost certainly not triggered by caffeine, because the capsules contained only 20mg of caffeine and previous studies have shown that only oral dose of more than 100 mg caffeine will elicit a significant increase in thermogenic response (Bracco. 1995; Dulloo. 1998 - suggest that 600-1,000mg/day is necessary for sign. increases in thermogenesis). 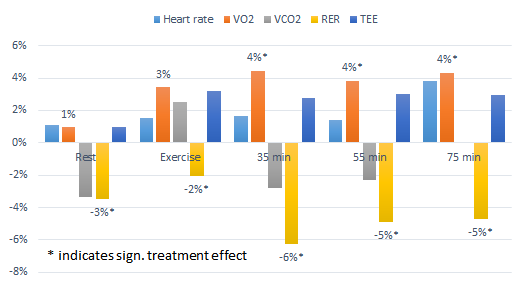 It's also worth noting that there were no significant differences in mean power output, RPE, lactate levels, RPM (Table 1), and HR levels between the GTE and placebo trials. This leaves little doubt that the effects were not mediated by direct ergogenic effects (= higher exercise performance / effort) in response to the GTE supplementation. Lastly, it should be said that even though this was not tested in the study at hand, previous clinical trials like Bérubé-Parent et al. (2005) report identical thermogenic effects for low and high dosages of GTE. Thus, simply taking more GTE probably wouldn't have changed the results considerably. Overall, the results of the study do thus support the ubiquitous claim that the ingestion of green tea extracts can significantly increase the fat oxidation at rest, during and after exercise when compared to placebo. In spite of the fact that the conclusion of the abstract to the study at hand makes it appear as if that was a practically highly relevant finding, there's one question neither the abstract nor the full-text of the paper actually address: Do the increase in fatty oxidation and the (albeit non-significant) increases in total and resting energy expenditure mean that consuming green tea extracts is going to help young, healthy, non-overweight women like the subjects in the study at hand lose body fat? Figure 3: If you do the math and calculate the difference between the amount of energy the women would spend during a given week with 3x ISE sessions with and without GTE, the results are disappointing: The difference per week amounts to only 105.4kcal (1%), which is very unlikely to have a sign. effect on fat loss (calculated based on data from Gahreman. 2015). 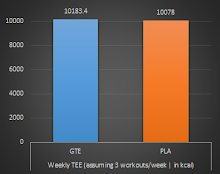 Let's do some math to decide if the changes matter, or not... Ok, if they'd do the same ISE protocol three times a week and the increase in REE and TEE would not change over time, young, lean women who consumed GTE on a daily basis would burn an extra amount of only 105.4/kcal per week. That's a pathetic 1% increase of which I don't have to tell you that it is not only stat. not sign., but also practically irrelevant. In fact, this may well explain why you cannot expect green tea supplements to do the weight loss work for you. With the increases in fatty acid oxidation and energy expenditure being only two items on the list of purported anti-obesity benefits of GTE, the results of the study at hand do yet not necessarily mean that GTE supplements were totally useless. What they do mean, though, is that these supplements won't make young women lose body fat without the help of an energy restricted diet, which is still the indispensable backbone of any fat loss regimen. In fact, specifically in the obese, the proven anti-inflammatory effects, as well as GTE's ability to reduce the absorption of both carbs and fats and to keep your appetite in check make it a viable addition to a reduced energy intake specifically in obese individuals (Hill. 2007; Rains. 2011). In view of the small increase in REE, but sign. impact on inflammation and glucose / lipid metabolism, specifically in the obese, it is thus not surprising that meta-analyses report only a marginal association between green tea consumption and body weight on the population level, but significant beneficial effects on weight loss maintenance in overweight subjects after reductions in energy intake (Hursel. 2009) | Comment on Facebook! Bérubé-Parent, Sonia, et al. "Effects of encapsulated green tea and Guarana extracts containing a mixture of epigallocatechin-3-gallate and caffeine on 24 h energy expenditure and fat oxidation in men." British Journal of Nutrition 94.03 (2005): 432-436. Bracco, David, et al. "Effects of caffeine on energy metabolism, heart rate, and methylxanthine metabolism in lean and obese women." American Journal of Physiology-Endocrinology and Metabolism 269.4 (1995): E671-E678. Dulloo, A. G., et al. "Normal caffeine consumption: influence on thermogenesis and daily energy expenditure in lean and postobese human volunteers." The American journal of clinical nutrition 49.1 (1989): 44-50. Dulloo, Abdul G., et al. "Efficacy of a green tea extract rich in catechin polyphenols and caffeine in increasing 24-h energy expenditure and fat oxidation in humans." The American journal of clinical nutrition 70.6 (1999): 1040-1045. Gahreman, Daniel, et al. "Green Tea, Intermittent Sprinting Exercise, and Fat Oxidation." Nutrients 7.7 (2015): 5646-5663. Gregersen, Nikolaj T., et al. "Effect of moderate intakes of different tea catechins and caffeine on acute measures of energy metabolism under sedentary conditions." British journal of nutrition 102.08 (2009): 1187-1194. Hill, Alison M., et al. "Can EGCG reduce abdominal fat in obese subjects?." Journal of the American College of Nutrition 26.4 (2007): 396S-402S. Jówko, Ewa, et al. "The effect of green tea extract supplementation on exercise-induced oxidative stress parameters in male sprinters." European journal of nutrition (2014): 1-9. Phung, Olivia J., et al. "Effect of green tea catechins with or without caffeine on anthropometric measures: a systematic review and meta-analysis." The American journal of clinical nutrition 91.1 (2010): 73-81. Rains, Tia M., Sanjiv Agarwal, and Kevin C. Maki. "Antiobesity effects of green tea catechins: a mechanistic review." The Journal of nutritional biochemistry 22.1 (2011): 1-7.